In this post, I will tell you about the most beautiful St. Petersburg metro stations that you need to visit on your trip to Saint Petersburg, Russia. 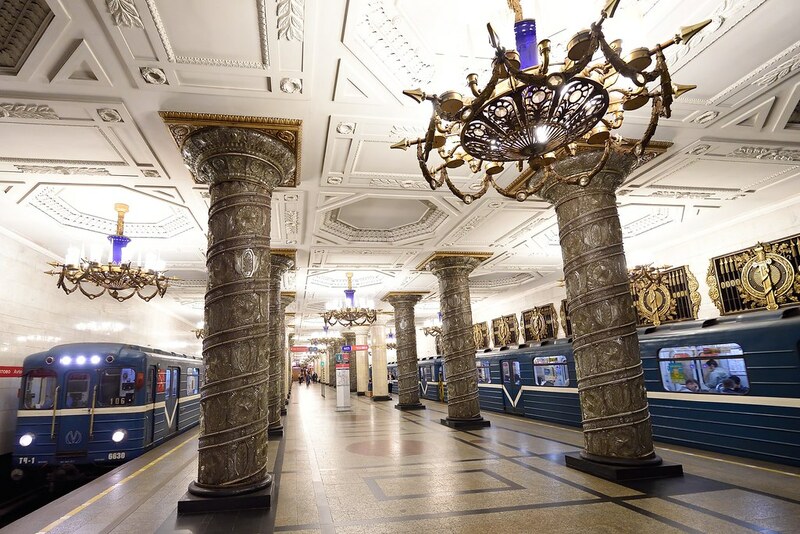 Russia has undoubtedly one of the most beautiful metros (subway, underground, tube – whatever you call it) in the world and not visiting it on your trip to Russia would be a mistake (considering that the underground ticket price in St. Petersburg was less than $0.7 (45 Rub) in 2018, and there is no time restriction, so you can explore St. Petersburg metropolitan for hours if you wish. 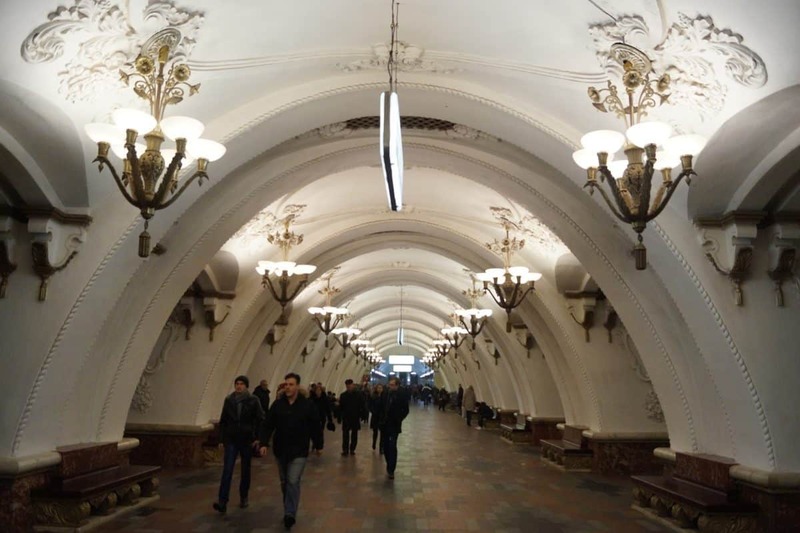 However, to spare you some time, as not all the metro stations in St. Petersburg are equally beautiful, I created this guide to the most beautiful St. Petersburg metro stations. I’m originally from St. Petersburg, Russia and composed this ultimate guide to visiting St. Petersburg – read it here (I promise a lot of useful information). If you want to see how does St. Petersburg metro map look like, here’s the link to the official website of St. Petersburg metropolitan that has the most updated information. There are plans to add some new stations to the map (and not only to the map), but it takes aged to build a new metro station in St. Petersburg due to the presence of underground rivers and the fact that St. Petersburg is located on multiple islands. Because of that, the metro stations in St. Petersburg are located very deep underground, and it takes a while to dig and freeze the tunnels under the city. 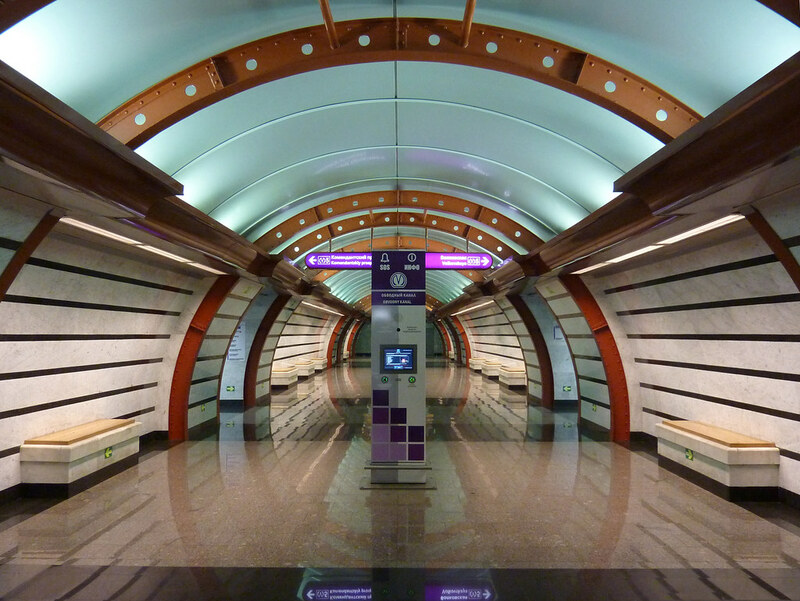 There are currently only 69 underground stations in St. Petersburg. Avtovo station is a highlight of St. Petersburg metro. I was lucky to live just two stations away from Avtovo and was passing this station every single time I needed to go to the city centre. Avtovo is fantastic, and it looks like a room of some palace – marble walls, chandeliers and dim light. The best time to visit the Avtovo metro station is around 12-2pm on weekdays, so you can see the station quite empty and take a good photo of it. There is not much to see in Avtovo apart from of a couple monumental residential buildings from Stalin Era, so I suggest you to move forward to your next metro-destination. Another one of my favourite metro stations in Saint Petersburg is Zvenigorodskaya and Pushkinskaya. These two are actually just one station where you can change from the purple line to the red one, so it’s one station but two platforms and two vestibules. Both stations are actually very different. Zvenigorodskaya is newer and it’s decorated with green granite and white marble. It also has a very beautiful mosaic art at the end of the platform. 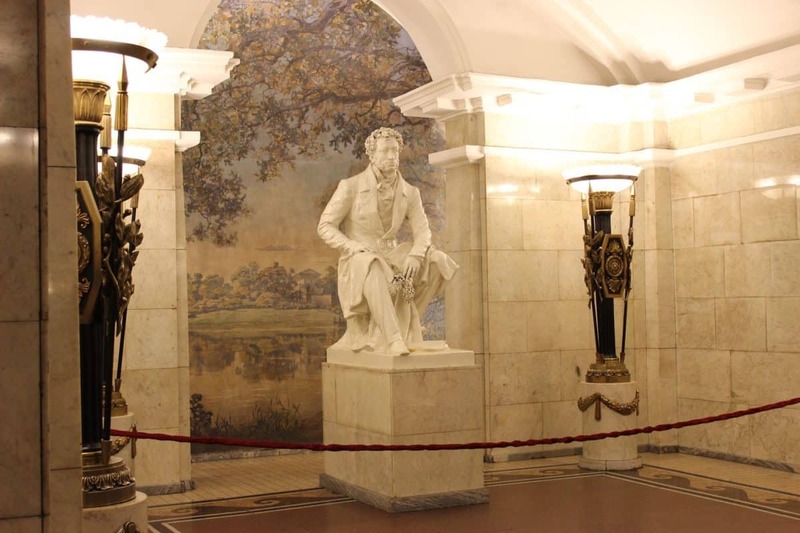 Pushkinskaya station is dedicated to the famous Russian poet – Alexander Pushkin (he wrote Eugene Onegin and many other novels and poems) and also looks impressive with the statue of A.S. Pushkin at the end of the platform. Admiralteyskaya is one of the deepest stations in the world (the second deepest to be precise – it’s located 102 meters below the ground level) and it has not one, but two escalators. I like the decoration of the station in the purple tones as well as the vestibule at the ground level. 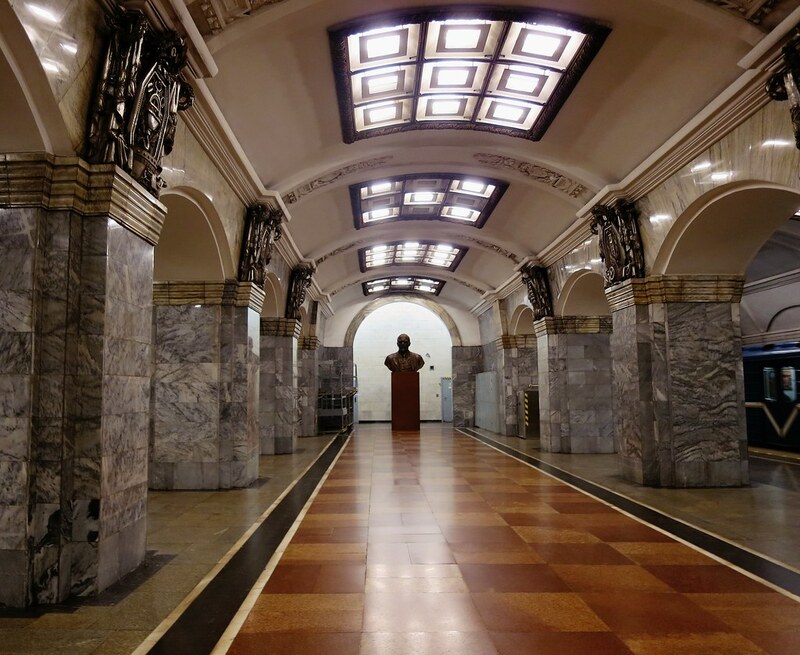 Admiralteyskaya metro station is located just a few steps away from the Hermitage museum, so you can go and look at the foyer of the station before heading to the Hermitage. 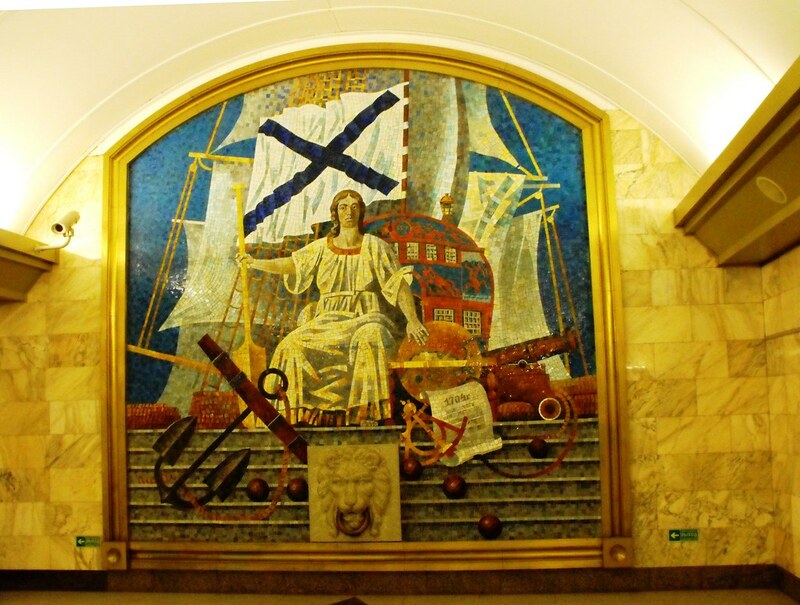 Narvskaya metro station in St. Petersburg is dedicated to the hard work of the people of USSR. It’s a typical USSR-style monumental station and it has high-reliefs of different respectable professions during the USSR on its walls. Another impressive station of St. Petersburg metro is Kirovskiy Zavod (Kirovskiy Factory). It’s decorated with grey marble and has a very special illumination – it looks like there is no ceiling there, just a sky above you. It’s the next station after Avtovo and it’s a station before Navskaya, so you can visit them all in one journey. One of the busiest stations of St. Petersburg subway or underground is Ploshad Vosstaniya, but it’s also one of the most beautiful St. Petersburg metro stations that you need to visit. It looks like a proper tunnel and it’s decorated with beautiful metal art. It’s a very central station – if you exit there, you can find one of my favorite affordable restaurants in St. Petersburg, ObedBufet (read my post about the best budget-friendly restaurants in St. Petersburg) and the biggest shopping mall in St. Petersburg, Galeria, is a few steps away as well. Obvodny Kanal is a station that I rarely used in St. Petersburg (also because it opened not so long ago – it’s a great example of modern metro stations in St. Petersburg), but it looks interesting, and to me, it resembles a spaceship. Another station on the same purple line as Obvodny Kanal is Mezhdunarodnaya. It’s also one of the newest stations in St. Petersburg, and it shows how much effort do people put into the look of the metro in St. Petersburg – the station is decorated with gold and looks great. There’s absolutely nothing to do bear the Mezhdunarodnaya metro station though, so I recommend you to take a look at it and get back to the city centre. 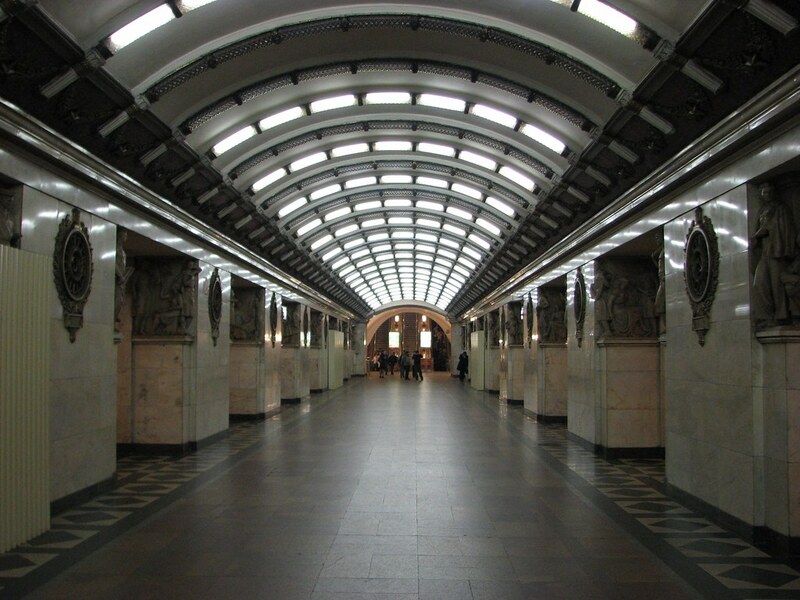 Okay, these were the most beautiful stations in St. Petersburg, Russia. But of course, beauty is in the eyes of the one looking, so what might seem appealing to me, might not be equally beautiful to you and vice versa, so I recommend you to visit more stations of St. Petersburg metro, to form an opinion of it. I’ve got a lot of blog posts about St. Petersburg, so feel free to check them out (St. Petersburg post category).